We decided to start something fun and new over on the SurveyAnalytics blog! We will feature a "Data Shows" news article each Monday. If it has the words "data shows" or "survey shows" in the title and is an interesting read, we'll feature it. We will share a few thoughts on what made the study interesting, what could have rounded out the survey, and any follow-up research ideas that should accompany the study. The first inaugural "Data Shows" Monday goes to Datafiniti's recently published report on states with the most fast food eateries. With 1 in 4 Americans eating fast food at least 1 time per day, it's no secret that America loves conveniently available food that's quick and instantly satisfying. Datafiniti broke down the top fast food restaurants in the nation. The obvious leading the pack were Subway, McDonald's, Burger King, Taco Bell, and Pizza Hut. Next, they reviewed the number of fast food locations per 10,000 residents. Breaking up the country regionally, the central and south had 4.4 to 4.5 fast food restaurants per 10,000 residents compared to the West at 3.7, and the East at 2.5. So what does this mean? If you love fast food, head to central or southern parts of America. Big or small city, you will find something you like. If fast food isn't your thing, head east or west. This is an incredibly intriguing study and I applaud Datafiniti for sharing their findings. What would make these results even more compelling is to use the data and run a correlation analysis between other social factors such as income, ethnicity, education, and obesity statistics. How does fast food consumption trend across these factors? 10/16 states are on both TOP 16 lists. There could be a potential correlation worth analyzing. With healthcare and wellness being part of major discussions in our nation, the next steps researchers can do is to take these data points and add social and economic factors to give a true understanding of the impact our fast food landscape may have on our overall health as a nation. We need a more holistic view of what this data means. The next set of research should consider how education, ethnicity, income, and standard of living may factor into the results. Noting the number of fast food restaurants is a great start, but there is more work to be done. The intention should not be to vilify the fast food industry and find who to blame for the obesity epidemic. Rather, it should be a study that everyday citizens and business organizations can use to make better decisions for us all. Today, we wanted to share some incredibly special news with you that is a milestone for us at SurveyAnalytics and QuestionPro. We are happy to announce that WorkXO has become a wholly owned subsidiary of QuestionPro. WorkXO, founded in 2015, created a revolutionary model for measuring workplace culture, a powerful proprietary technology for analyzing it, and a proven methodology for ensuring organizations get and stay intentional about managing it. Clients like T-Mobile, Cisco, NBC Universal, Security First Bank, and Southern Dental Alliance use WorkXO’s first-of-its-kind culture management platform – Workplace Genome® – to turn workplace culture into a competitive advantage. What does this mean for our customers? And how does culture management fit with online surveys and analytics? Let me answer all your questions in this post. Since WorkXO’s beginning in 2015, they have used QuestionPro survey technology to power their culture measurement and analytics platform. The WorkXO team has been impressive in developing and perfecting a people-science around culture that is revolutionary. This, coupled with our scale of information capture from employees makes us the only global culture-analytics platform in the market today. We found we had a lot common and that our vision the same – Being fully committed to developing data-rich workforce solutions that drive action and results. What does this mean for QuestionPro customers? We know our customers use QuestionPro in many inventive and creative ways, so this a great opportunity for customers who have not explored Workforce or WorkXO to think about workplace analytics, employee surveys, and how culture can be a functional operating system that can be tracked, quantified, and measured over time. What’s next for Workforce Technology? Our predictions about the next generation of people analytics are simple – We feel strongly that culture should and will be at the heart of the next wave of workforce technology. In taking that next step, we are excited and honored to work with Charlie and his team to scale WorkXO to the broader market while having him lead the way in a new chapter in our QuestionPro Workforce platform. Cheers to a new chapter for QuestionPro Workforce and the future of workforce technology! You lose the humanization of their responses. Facial expressions, voice, tone, and body language. That is all lost. Unless you are recording the person as they take the survey, you miss many queues that can potentially answer why they responded in that fashion. You are missing out on immediate and in-the-moment reactions. Companies who send feedback surveys even hours after the experience may miss out on capturing a true response. Depending on respondent recollection is risky and can skew the data to be vaguer the longer the time between survey and experience. You are not where your respondents are, so how can you claim to truly know them? The craving for authentic experiences is higher than ever before. If you want to really know how people feel about your tools or services, meeting them in their natural habitat works well. Authenticity breed authenticity. This applies to market research as well. What now - How can we connect with our respondents in real life? Find where they physically are and make your presence known. 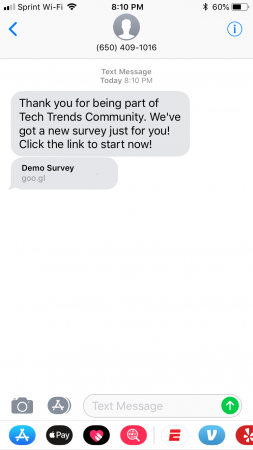 Train a team of friendly data collectors who love engaging with the prospective respondents to gather responses while they are in the middle of an experience. If you are looking to target folks who frequently travel for work, the best place is to be at the airport. Offer them a free cup of coffee in exchange for their feedback on how to make their flying experience better. Use better technology to gather data and analyze data quicker. Ditch the pen and paper and use offline survey tools that only require an iPad to run and collect surveys. The best part of ditching the paper and pen - not having to input the data afterward! You just have to sync it where reliable wifi is available. As someone who used to spend late evenings or early mornings putting results into a spreadsheet by hand, it can take HOURS of work. Who wants to spend time looking at responses and trying to figure out different handwriting? Not me! Cutting this time out and being able to deliver results faster and more accurately is the greatest benefit of going tech in the field. 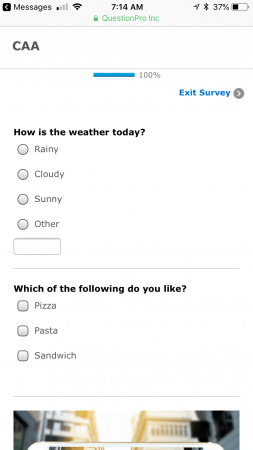 Make it simple and fun for respondents and the field team. Nobody in the field wants to struggle with forcing respondents to take a long and complicated surveys. Keep it simple and quick by boiling done the key objectives that survey must answer. Making it fun for the respondent and field team is all about the point of engagement. Switch up the locations, allow field teams to walk around in certain areas, and get them to share feedback on what works, what doesn't, and how to change things up the next day. You can also think about adding incentives to attract respondents. If you are at a music festival, you can offer free bottled water in exchange for taking a quick survey.